Thank You Commonwealth Senior Living! Thank you so very much to the staff and residents of Commonwealth Senior Living, formerly known Hermitage Eastern Shore, for providing Christmas gifts to members of No Limits again this year. Your kindness and continued support over the years means so much to us and we can’t thank y’all enough! Below are a few pictures of No Limits’ members opening up their gifts! Corina helping with the Christmas punch! Enjoying United Way Exercise with Betsy before our Secret Santa gift exchange. Jason with his cool new Christmas shirts! Amy and her new hat and glove set. A perfect gift! Corina and her “mini me” a.k.a her daughter Kirsten! Brandon got new body wash that smells great! Zel and his jar of pickles. Sherry always helps us to make the Christmas punch extra tasty. Thanks Sherry! CL is happy about his gift card! Shianne and Daniel enjoyed their gifts too. Hand-made scarves for Matt and Randolph! Merry Christmas! A hand-made scarf for Betsy too! Cool! CL hand-made his entire family comfy pillows! Great job. A big thank you to Maryann for assisting with this project! Jason likes Corina’s gift too! A soap and perfume set for Denise! Awesome. David got an antique rifle blueprint and advertisement for his present. Too cool. Whip it up David, whip it up! Peanut butter cookies for our friends for the holidays! Maryann and Amy are busy getting hand-made gifts together for our friends in area nursing homes. Great job! Purrty in pink! Good work Amy. Ready for the oven! Yum. We baked for our animal friends too! Men hard at work making biscuits for the dogs at the local SPCA and Animal Control facility. 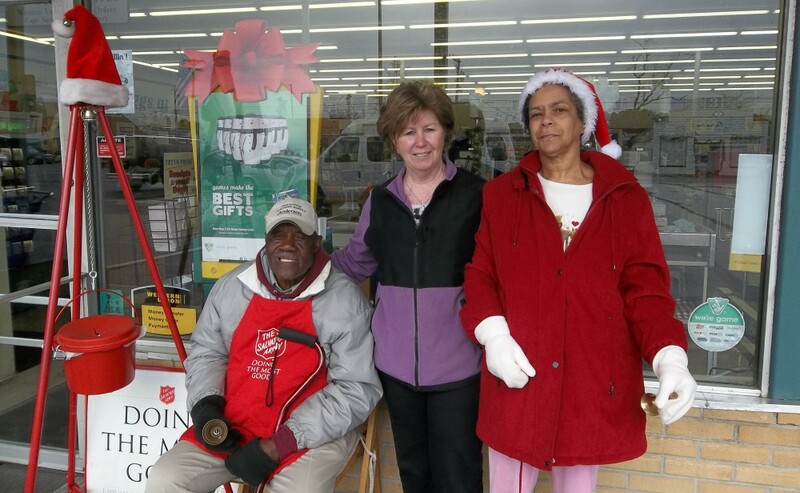 Bell ringing buddies on their way to ring the bells for the Salvation Army! A silly shot of the bell ringing buddies, haha! We would like to thank the Kiwanis Club of Accomack very much for offering No Limits booth space at their annual craft show this year as well their gracious cash donation to the No Limits Day Program! Program Coordinator, Emma, receiving the cash donation from the Kiwanis Club of Accomack at the No Limits booth during the 2018 Annual Kiwanis of Accomack County Craft Show. Thank you again to the Kiwanis Club of Accomack! David helped to hand make over 20 Christmas cards using recycled Christmas cards from years past this week. Thank you David, and thank you Laurice Hohlt for donating the recycled cards! Look how nice everything turned out. We can’t wait to deliver these hand made pillows and scarves to our friends living in nursing homes! 11 days until Christmas! Presents are starting to appear under the No Limits tree! What a wonderful time of year! Brandon and David having a good time working on making festive night lights. Thank you to No Limits Board Member, Laurice Hohlt, for providing us with materials to make these useful decorations! Amy’s not afraid to get her hands dirty. A few of our finished products. These would also make cool Christmas gifts! We were inspired with the holiday night lights craft and we decided to hand make holiday pillows to gift to our friends living in local nursing homes. Here’s David hard at work making a pillow. Making presents just like Santa’s elves! Amy helping Maryann out with sewing. Way to go! Amy with the pretty pillow she made. We hope our friends enjoy their gifts!